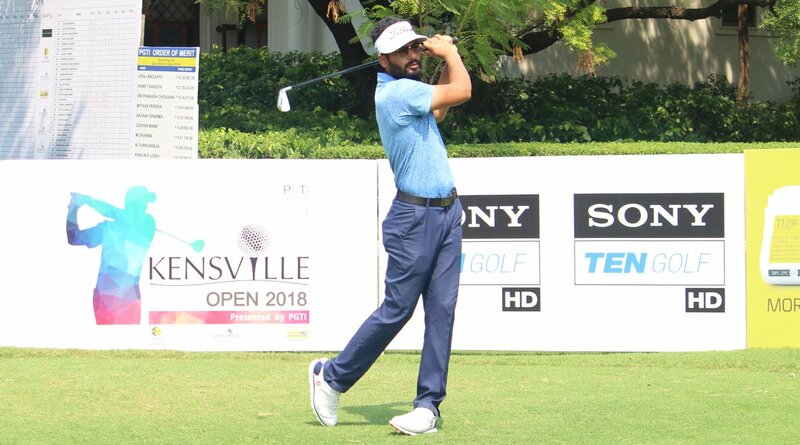 Ahmedabad, October 3, 2018: Gurugram-based professional Tapy Ghai surged ahead in round two of the Kensville Open 2018 presented by PGTI. The 22-year-old Ghai shot a two-under-70 on Wednesday to take a one shot lead at five-under-139 at the Kensville Golf & Country Club. Delhi’s Sachin Baisoya was placed second at four-under-140 after his second round of one-over-73. Tapy Ghai (69-70), who was tied third and two off the lead at the start of the second round, made his way to the top with four birdies and two bogeys in round two. Ghai, who turned pro last year, was on fire on the back-nine as he sank birdies on the 13th, 14th and 17th. Tapy, currently ranked 44th on the PGTI Order of Merit, then lost his way a bit on the front-nine when he bogeyed the third and eighth. He finally pulled one back with a birdie on the closing ninth. But that was enough to place him in the lead. Ghai, who has two top-20s to his credit in the current season, said, “I’ve worked hard on my game this year and now the results are beginning to show. I’ve already had better finishes this season as compared to 2017. My hitting is also much better this season and is improving every week. “I took advantage of the par-5s today, making birdies on three of the four par-5s. There was not much wind in the morning and I capitalized on that. One needs to play regulation golf here by trying to hit maximum fairways and greens and make putts. Sachin Baisoya (67-73), the overnight leader by one, slipped to second place after posting a 73 that featured an eagle, three birdies, four bogeys and a double-bogey. Chandigarh players Akshay Sharma (70) and Abhijit Singh Chadha (72) along with Lucknow’s Sanjeev Kumar (71) were in tied third at three-under-141. The cut was declared at four-over-148. Fifty professionals made the cut. The two local players, professional Arshpreet Thind and amateur Lokinder Malik, missed the cut.